It has been sitting there through multiple generations.. a place which has symbolized the power of freedom and democracy in the minds of Americans, a place which has been an anchor of pride to be called American, even when the politics being decided there are nothing to be proud of. There is something about a place called Washington DC though, that even might give an uninformed visitor a strange sense of something more going on than they have been told about their Capitol. There is something amazing about the sin of pride as I have seen. The first of all sins in the history of sins, and maybe the last to be conquered, it is a tool that Satan knows how to wield very well and with it he keeps minds entangled in small cages. It is not easy for an individual to admit to themselves, or much less others, that they have been terribly wrong in the way they have viewed their world and reality, and this is how the enemy boasts his presence in front of the very noses of his victims without being discovered. There is something that he has boasted in the capitol of the United States that generations of citizens have not notice and those who are informed might rather not hear. Nearly all of the American founding fathers, as they are called, were freemasons. Freemasonry is not a Christian organization and it is not simply a club of men who do charity work in their communities. This is an organization founded on very ancient principles of numerological, astrological and alchemical knowledge which came to be given into the hands of mankind by rebellious angels before the flood. Those who have kept this knowledge through the ages have known that there are principles which govern the universe which can be drawn on to give power to those who know how to use them. These bodies of knowledge and the power that comes by using them were things that YHWH recognized as having the ability to cause untold sin in the earth and so it did before the world was flooded. It is this ancient knowledge which has been used to lay the foundations of many cities according to a power grid of geomagnetic energy, and to incorporate geometric shapes which have the mathematical qualities to enhance that power. These are the forces which spiritual entities operate, by and by them can be empowered and called on. By looking at the US one dollar bill it is able to be seen for what purpose the founders established this country, a New World for the New World Order. It is natural then, that the center of American government should be built to reflect the occult goals which were the foundation of the future vision for America. It was a man named Pierre Charles L’Enfant who was first assigned the task to draw up the plans for the nations capitol, and he is remembered as being the architect of DC, but another man, Andrew Ellicott with the assistance of astronomer, Benjamin Banneker, made the final revisions of what became the actual layout of the city. Both L’Enfant and Ellicott were high level freemasons, but Ellicot was well known for his mathematical genius and his great accuracy in land surveying. 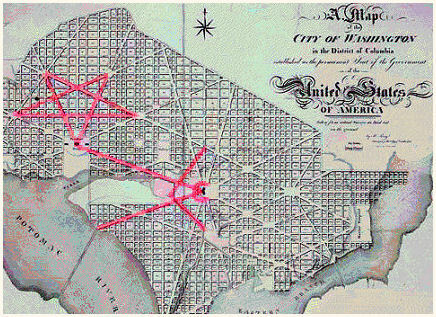 There is no denying, looking at a map showing the street and building plan of Washington DC, that there is a clearly visible five pointed star, or pentagram which has certain key features aligned to its points. Facing upside down, the pentagram’s lower point ends directly in the white house, a straight line north of the white house between and above the upper points of the pentagram sits the temple of the Supreme Council of 33 degree Freemasonry. The Du Pont, Logan, Scott, Washington Circle and Mt Vernon Square complete the star. from the point of the White House to the Capitol building and then proceeding in a line from the Capitol Building to the Jefferson Memorial can be seen the image of the Masonic compass. The points between the temple of 33 degrees, the Lincoln Memorial and the Capitol building with surrounding areas design a formation known to Freemasons as the triple tau. This is a symbol which stands for these mottoes in Masonic ritual – the Temple of Jerusalem, a key to the treasure, the place of concealment of the precious thing, the precious thing itself. The temple reference is easily placed where there is an actual temple, the Supreme Council of 33 degrees. 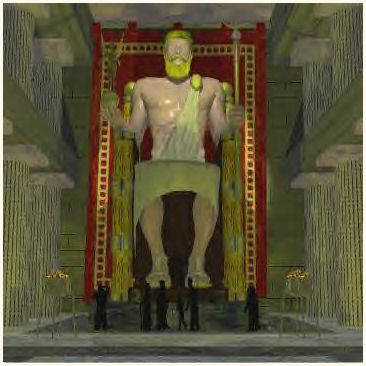 The Lincoln memorial is made to recreate the appearance of a statue of Zeus, king of the Mt Olympian gods who are comparable to the rebel Watchers residing on Mt Hermon. This is the key to the foundation of the New World Order. The Washington monument is obviously an Egyptian styled obelisk and in fact, the whole mall area of DC is situated to resemble the layout of Giza. The obelisk is known in pagan tradition to be a phallic symbol which is a memorial to the invasion of angelic reproduction in to the human world. The monument is placed directly across from the capitol building. The great dome on this building is the symbolic representation of the feminine aspect or the human women which were taken as wives by rebel angels. The top of the Capitol dome is crowned by a standing female which can be seen in multiple logos and statues throughout the world. This woman is representative of Ishtar. This area between these two structures is a location charged with power, and it is well known that a system of concealed tunnels runs beneath it. 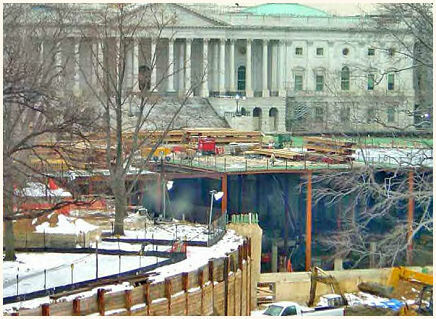 The photo below was taken in February 2004 shows a serious excavation which had been conducted under the area. 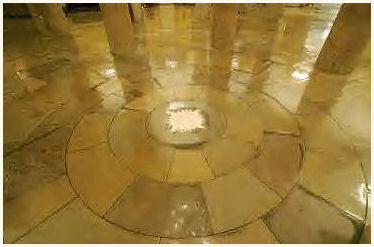 in the exact center of DC, in the very center of the Capitol building floor, beneath the very center of the dome depicting a deified representation of George Washington is a brass compass star embedded in the floor. Beneath this brass star is a crypt which was built supposedly to entomb Washington himself, though he was never buried there. A question to ask yourself perhaps is, is that tomb empty now and what if anything does it conceal? It is a matter recorded in the National Archives, that just as Giza, DC has been laid out to reflect certain celestial bodies, including the belt stars of Orion. In comparing Giza with DC, the structure which would be representative of the same position as the Sphinx is the Capitol building. the Sphinx also has been noted as having a concealed, secret chamber beneath it containing pre flood records. 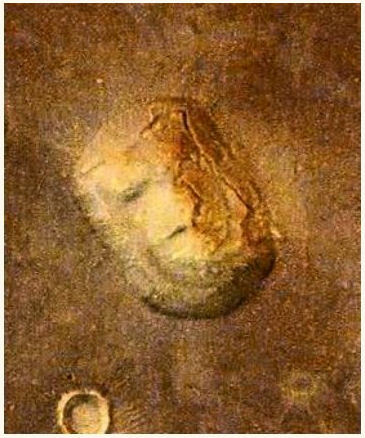 The spirits which were channeled through a man named Edgar Cayce who lived in late 1800s and early 1900s mentioned these records, as surely the spirits themselves were beings who witnessed the building of the Giza complex and understood its nature. What is perhaps the most revealing observation one can make of this design plan can be found, not on this world, but on the surface of an entirely different planet. 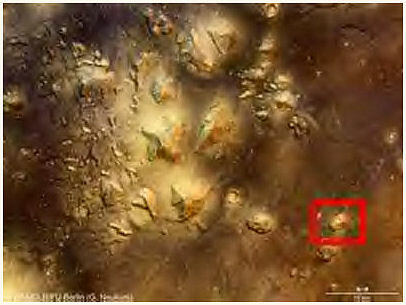 If you have never seen the city complex which has been photographed at a location called Cydonia Mensae on Mars, it is a sight which will make you ask questions you may have never asked yourself before. It maybe cannot be ignored that what has been designed on Earth at positions of power and influence have a background of ancient knowledge that goes even beyond the borders of this planet, to worlds where, in the far past, angels have built cities.